"The next time rain ruins your dream of a grilled chicken dinner, I hope you fire up your broiler and give this easy, alternative method a try. Not only are you getting the same intense, direct heat, but you also have more control, since you can adjust how far the chicken is from the flame. I prefer the meat about 7 to 8 inches under the heating element, but feel free to adjust as needed. Garnish with freshly squeezed lemon juice and fresh oregano." Spread onion slices in a single layer on the bottom of a baking dish. Season chicken with salt. Place chicken halves, skin-side down, over onion rings. Cook chicken in the preheated oven, turning every 7 minutes, until caramelized, no longer pink at the bone, and the juices run clear, about 30 minutes. An instant-read thermometer inserted into the thickest part of the thigh, near the bone should read 165 degrees F (74 degrees C). 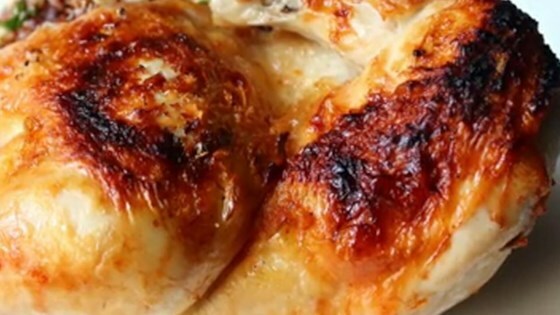 See how to make juicy broiled chicken with perfectly crispy skin. This was great AND easy. I used drum sticks and thighs. Added a little pepper with the salt. Very tasty, easy and well received by all! This was SO GOOD and so easy to make. I added a little bit of fresh cracked black pepper and a pinch of rosemary. Lunch was awesome. Thanks, Chef John. Very easy, very quick and delicious. I watched the video which lemon was suggested. I used lime juice...very nice added flavor. The onions were great too. TY, John. So easy and so delicious. I can't believe this doesn't have a million five-star ratings. We paired this with the Roquefort PEAR Salad from AllRecipes, and it was a success. Thank you, Chef John!